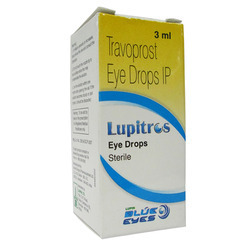 Our product range includes a wide range of Eye Drop such as Lupitros (Travoprost) Eye Drops and Latanoprost. Backed by our rich industrial expertise in medical sector, we are actively engaged in offering supreme quality assortment of Lupitros (Travoprost) Eye Drops. These drops are formulated using best-grade chemical compounds and advanced techniques. In addition, our offered drops are tested upon different quality parameters under the direction of our quality testers to ensure their effectiveness. Offered drops are prescribed for the treatment of open-angle glaucoma and intra-ocular hypertension in adults and children. Apart from this, our offered drops are widely known for different features. 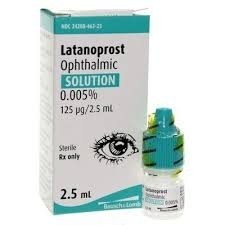 Travoprost ophthalmic solution is prescribed for the treatment of open-angle glaucoma and intra-ocular hypertension in adults and children. Travoprost ophthalmic drops lower the eye pressure by increasing the level of eye fluid drainage via the ocular mesh. Travoprost should not be used in patients with an allergy to any synthetic prostaglandin ophthalmic drugs/analogues. Store the ophthalmic drops at room temperature away from heat and moisture. Our prestigious clients can avail from us a qualitative spectrum of Latanoprost that is used for treatment of eyes. The offered drop is formulated using finest quality chemical compounds and highly developed machines in conformity to industry distinct standards. In addition to this, we also offer this drop in diverse personalized packaging options within a promising time-frame and at most affordable rates.